Acupuncture forms part of traditional Chinese medicine (TCM). Various sources have proposed that acupuncture dates back to anything from 3000BC to 1000BC. Traditional Chinese Acupuncture uses meridians, based on the diagnostic and clinical reasoning approach of Traditional Chinese Medicine . This entails comprehensive knowledge of the 5 element theory, tongue and pulse assessment. TCM is based on the concept of injuries/ill health being a manifestation of imbalance in the body's energy. This balance requires two key forces- Yin (negative) and Yang (positive). Hence, Acupuncture aims to restore this homeostatic balance by the insertion of fine acupuncture needles that influences the flow of Qi (pronouced as chee). Qi circulates through the body through channels or meridians. The stimulation of appropriate acupuncture points within the meridian may free stagnation, increase QI or reduce excess QI to the specific area or organ, hence, re-establishing a normal QI flow and balance. 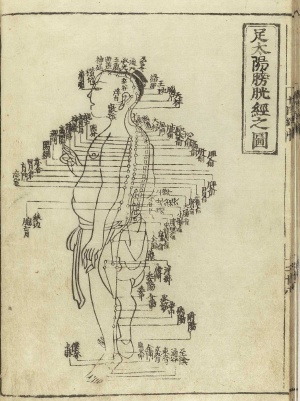 Like Traditional Chinese acupuncture, western acupuncture uses meridian points but applies it to western scientific reasoning with consideration to anatomy and Neuro-physiology. Practitioners that provide western acupuncture do not use any Traditional Chinese mode of assessment and diagnosis to treat their patients. Instead practitioners aim to promote healing through stimulation of the nervous system at the local level, spinal cord and brain stem level. Hence, Physiotherapists often provide other forms of treatment- manual therapy, home exercise program in conjunction with acupuncture. Acupuncture is a modality that is now being used in Western medicine to treat pain and is one of the many skills employed within physiotherapy as part of an integrated approach to the management of pain and inflammation. Physiotherapists have been using acupuncture for almost 40 years  and are the largest providers of acupuncture within the NHS. Physiotherapists base their treatments on scientific research and clinical evidence and although there are many research studies undertaken on acupuncture they do not provide solid evidence. The studies often use small numbers and in some cases use animal subjects; it is also difficult to provide sham acupuncture resulting in flawed or ambiguous results. Therefore quite often the efficacy and reliability of acupuncture has been anecdotal and experiential. Although many theories have been put forward about how acupuncture works, there is still no definitive agreement or clear scientific explanation. There have been studies where the existence of Meridians has been investigated  but this still does not explain why it is effective in treating many conditions or the traditional Chinese explanation of how it works - based on yin and yang and the five elements. There are studies that claim acupuncture is a placebo whilst others set out to prove not only it’s value but offer scientific theories. One such theory is based on the pain gate theory first suggested by Melzack and Wall in 1965. Early studies have shown that acupuncture and Transcutaneous Nerve Stimulation are equally effective at relieving low back pain indicating that Acupuncture can reduce pain by stimulating the brain and spinal cord . More recent studies support this theory and have shown that acupuncture produces natural pain-relieving chemicals such as melatonin and serotonin which can influence sleep and feelings of well-being. Somle sources and research studies also claim that acupuncture releases endorphins, however many of the studies, that are used as examples to support this theory, use Electro-acupuncture and a recent review of the literature concludes that there is no evidence supporting the claim that acupuncture alone releases endorphins, although it does acknowledge that endogenous opioids are released but dependent on the acupuncture dosage. Based on these findings and knowledge that these chemicals assist the body's healing processes and offer pain relief it makes sense to include acupuncture prior to other treatments such as manual therapy or exercise in order to aid further recovery. Moxabustion and cupping are techniques used to introduce warmth into the acupuncture points, either at the end of the acupuncture needle in the case of moxabustion, or to areas that require increased stimulation of Qi flow in the case of cupping. These enhancements have the effect of increasing the circulation, removing waste products, and reducing muscle spasm and pain. Moxabustion and cupping may also be used as precursors to the physiotherapist stretching the damaged tissue or mobilising a joint. Conditions treated with these techniques include osteoarthritis, areas of poor Qi flow and cold conditions. This technique is particularly useful in chronic pain problems and solid research to supports its use. Your physiotherapist may use transcutaneous electrical nerve stimulation (TENS) machines over specific acupuncture points in order to help this mechanism and enhance pain modulation. “Needles can kill people but cannot save dead peoples’ lives”. This quote was historically used to promote safe needling practices and highlight the importance of TCM technique and theory. Like any form of medical treatment it's important to think of patient safety. Hence all patients should be screened for the need for special precautions and Contraindications. ↑ White P. A background to acupuncture and its use in chronic painful musculoskeletal conditions. Journal of the Royal Society for the Promotion of Health. 2006; 126(5), 219–227. ↑ 2.00 2.01 2.02 2.03 2.04 2.05 2.06 2.07 2.08 2.09 2.10 The Physiotherapy Acupuncture Association of New Zealand. What is Acupuncture. Available from http://www.paanz.org.nz/mainmenu54/page70/What+is+Acupuncture+-+PAANZ.html (accessed 27 March 2019). ↑ Ahn, A. C., Colbert, A. P., Anderson, B. J., Martinsen, Ø. G., Hammerschlag, R. , Cina, S. , Wayne, P. M. and Langevin, H. M. Electrical properties of acupuncture points and meridians: A systematic review. Bioelectromagnetics. 2008. 29: 245-256. ↑ 16.0 16.1 Grant, Alicia, and Bo-Ying Ma. "The safe use of difficult & dangerous acupuncture points." The Journal of Chinese Medicine. 2003; 72(12),11-15.